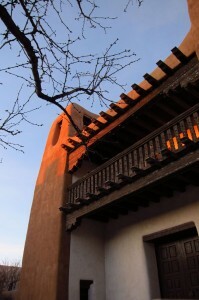 Just after New Years I attended the INFORMS Computing Society (ICS) conference in Santa Fe. Fortunately or unfortunately their acronym works out as the same as our very own Institute for Computational Sustainability (ICS) . In a way this is fitting since a large number of their problems are sustainability related, particularly in power grid and water management. The conference is meant to be a way for the Operation Research community to reach out to Computer Science and Artificial Intelligence researchers. The solution methods most commonly used are Integer Programming, Linear Programming and local search methods which are referred to as ‘meta-heuristics’. The focus is largely on exact optimization results but there is a growing amount of work on approximate solutions as well. One exciting thing is there is a lot of interaction between this community and actual power supply or water management utilities in the United States. So it if you aren’t in this community it may be useful to consider comparing this work with your own learning and optimization methods on their problems or to compare to their methods. The abstracts are definitely worth a look and can be found here . The conference was somewhat eye opening for me as someone in Artificial Intelligence/Machine Learning to see how much work is still going in to making math programming optimization methods more and more powerful. It seems that at the very least these methods should be used for comparison when presenting clustering or planning results. Even better would be to increase the collaboration between these communities on using the best parts of different methods. Rahul Jain at USC on MDPs for smart power grids as Linear Programs. Using the occupancy measure, how often states are visited, as a proxy for optimizing the policy directly. Modelled using conditional values as risk. Michael Trick from CMU does the yearly scheduling for Major League Baseball amongst other things. He gave a very entertaining talk on how far LP solvers like CPLEX have come and how the process of many practitioners has shifted from trying to find ways to make the problem smaller, to trying to find ways to provide enough hints so that the highly optimized solvers can find better solutions. Warren Powell from Princeton spoke on general optimization techniques revising the tutorial he gave in Denmark last summer at ICS 2012 (The other ICS that is.). He also spoke on work their lab at Princeton is doing on management of power grids in real time where some of the relevant variables are highly stochastic such as weather or the hourly spot pricing for electricity. A fascinating talk by Victor Zavala of Argonne National Labs on the need to optimize cooling in thermal power generation like nuclear or coal plants. This is hard because it relies on ready access to cool water so droughts, rain and humidity are actually very relevant for planning how to run your power plants. Nathaneal Brown from Sandia National Labs on the problem of planning maintenance of bridges and other urban infrastructure in such a way that effect of major earthquakes will be minimized. They consider maintaining multiple paths between major population centres and hospitals, etc. Sarah Nurre at Renessealar Polytechnic Institute has an interesting problem of real time scheduling of power line restoration after hurricanes where requests arrive in real time but planning decisions about staff and materials need to be made beforehand and the goal is to restore power as quickly as possible. Of course, I was there so I was presenting my own work in this area which is on policy gradient search methods for planning in spatiotemporal problems like forest management. If you are looking for some light reading for the weekend the first mandated US National Climate Assessment has been released. It’s just 400 pages and includes the latest scientific knowledge on a range of topics in climate chance and sustainability with predictions and impacts on the climate in the US and at at least some data about Canada as well on brief perusal. Conference: AAAI Conference on Artificial Intelligence with a special track on Computational Sustainability for the third year in a row. AAAI is Co-located this year with UAI2013. Deadlines: (Last Chance!) Abstracts: Jan 19, 2013. Papers: Jan 22, 2013. Time and Place: July 14-18, 2013 in Bellevue, Washington, USA (near Seattle). Conference: International Joint Conference on Artificial Intelligence The theme of IJCAI 2013 is “AI and computational sustainability“. The conference will include for the first time a special track dedicated to papers concerned with all the aspects of Computational Sustainability. Deadlines: Abstract: January 26, 2013. Paper: January 31, 2013. Time and Place: Beijing, China, on August 3-9, 2013. (NEW) Conference: International Green Computing Conference including research on a broad range of topics in the fields of sustainable and energy-efficient computing, and computing for a more sustainable planet. Time and Place: Arlington, Virginia, USA. June 27-29, 2013. Workshop: Energy Aware Software-Engineering and Development (EASED) provides a broad forum for researchers and practitioners to discuss ongoing works, latest results, and common topics of interest regarding the improvement of software induced energy consumption. Conference : ICT for Sustainability Conference : aims to bring together leading researchers to take stock of the role of ICT in sustainability, to create an interdisciplinary synopsis, to inspire new approaches to unleash the potential of ICT for sustainability, and to improve methodologies of evaluating, developing, and governing the effects of ICT systems on the sustainability of societal and environmental systems. Time and Place: ETH Zurich, Switzerland. February 14-16, 2013. Are we missing something? Let us know or join the CompSust community on G+.